The Santa Cristina farm is located in Cerrado Mineiro, a place known for its fertile lands in an altitude of 902m. It processes natural coffees and harvest is between April and July. Total size of the farm is 232,87 ha with a coffee growing region of 137,51 ha. Varieties include novo mundo, catuai, acaiá and IBC 12, with an annual production of 6,000 bags. 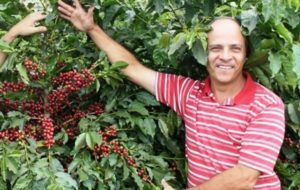 The Santa Cristina farm was acquired by the current owner Ricardo Aguiar Rezende in 2010 with the proposal to develop a project to produce organic coffee with high technology and quality. The farm is part of Saquarema Group, that has other organic farms as well. Now, the farm is in its third year of production of certified organic coffees. Cupping Notes - Well balanced, creamy body, sweet with notes of milk chocolate, marzipan, peanut butter and cocoa with mild stonefruit.